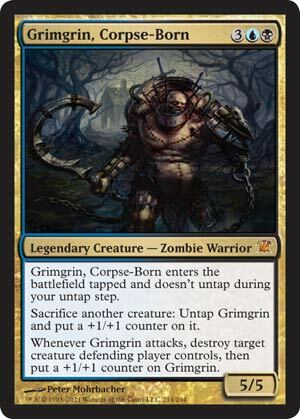 I’m mainly mentioning this card because of the Morbid Mechanic. 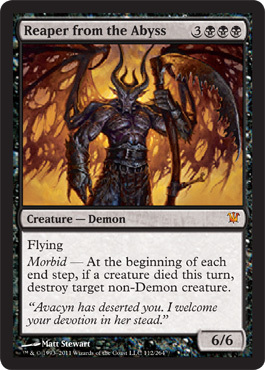 As Daily MTG put it, “In Innistrad, the death of one may be the opportunity for others.” Do you know what deck kills things all the time? Birthing Pod. 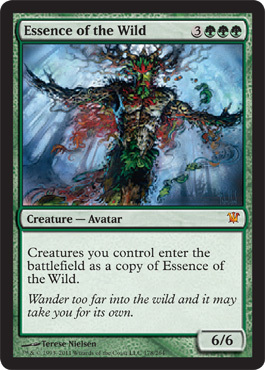 Seeing as a creatures dies before the creature emerges from the Pod, you could sacrifice a Simulacrum, draw your card, then have Hollowhenge Scavenger come into play, and gain 5 life. 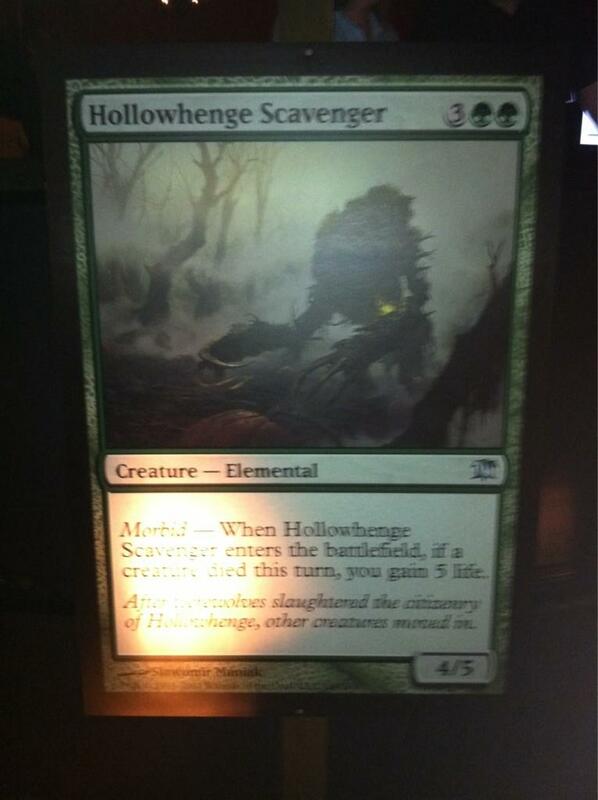 Seeing as Obstinate Baloth, which is what Pod usually gains life from, is going out, I think Hollowhenge Scavenger and other creatures with Morbid could see play in the new format with the Innistrad block. 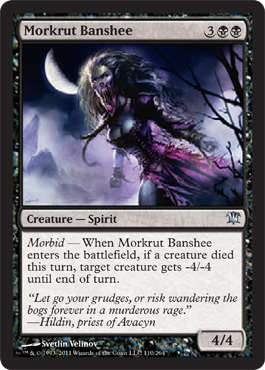 Maybe other creatures with Morbid is horrifically outclass this card. But until we have the entire set, we can’t be sure of that. 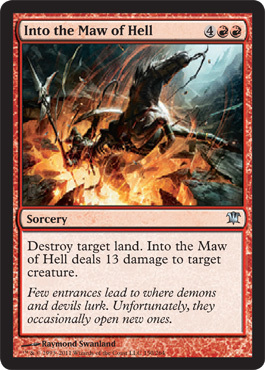 So, it turns out the cards that don’t have a converted mana cost are actually Double Faced Cards, the opposite side of the card having the transformed card on it. 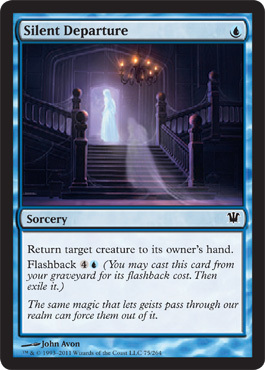 And, along with this, they revealed a few more cards! 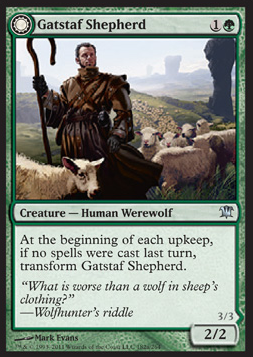 Gatstsaf Shepherd, like Mayor of Avabruck, transforms if no spells were cast last turn, he transforms into Gatstaf Howler, who transforms back if a player cast two or more spells the last turn. 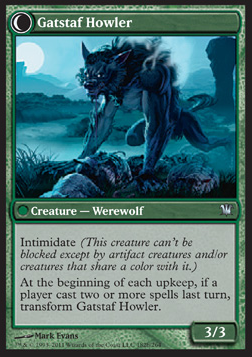 They’re decent, but I’m not sure the fact they transform whether or not spells are being cast could be a problem for Werewolves. 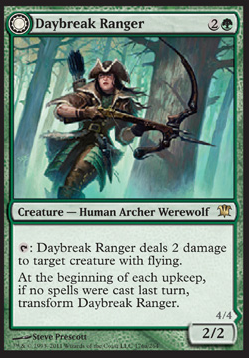 Daybreak Ranger is decent, dealing 2 damage to anything with flying, and he transforms just like Gatstaf and Avabruck, when there were no spells cast last turn, he transforms into Nightfall Predator, who “fights” for 1 red. Fights is a new mechanic that causes two creatures to do damage equal to their power to each other. 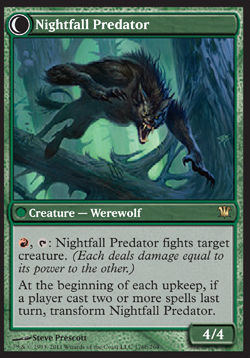 So Nightfall would deal 4 damage to target creature, then target creature would fight him. He, like the other wolves, transform back if two or more spells were cast. 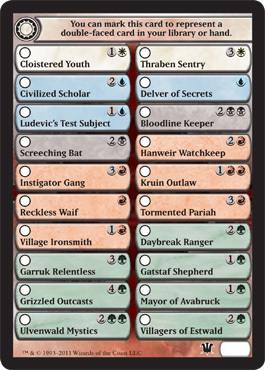 These checklist cards will be in each set, and have regular card backs. They can substitute any creature that transforms, in your library or hand. You have to use a separate one for each one you use, and you have to have the actual cards put aside to put into play when they’re on the battle field or graveyard. Honestly, this would be good if you don’t plan on sleeving when you draft the set. 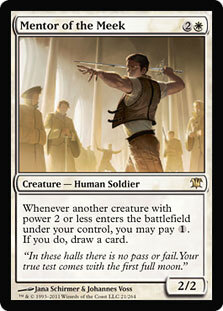 However, this also reveals the names of all cards with transform in the set; including Garruk Relentless. 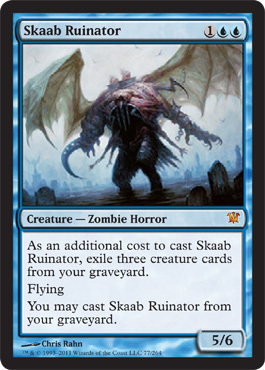 So in Innistrad’s 264 cards, 20 of them will have this new Transform ability; and, as always, I’ll update as soon as I get word of any more spoilers. Until then, let’s hope I get to sleep tonight instead of updating all night.